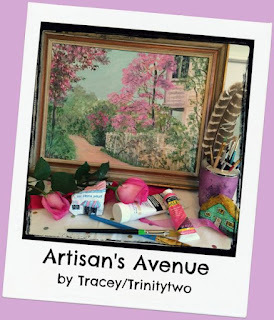 Artisan's Avenue is a place to showcase fantasy, horror, or sci-fi artists and their creations. As you may have guessed, the name pays homage to Artist's Alley and the wildly talented people I've met at various comic cons. I am continuously fascinated and impressed with their creativity and imagination and I hope our readers feel the same. 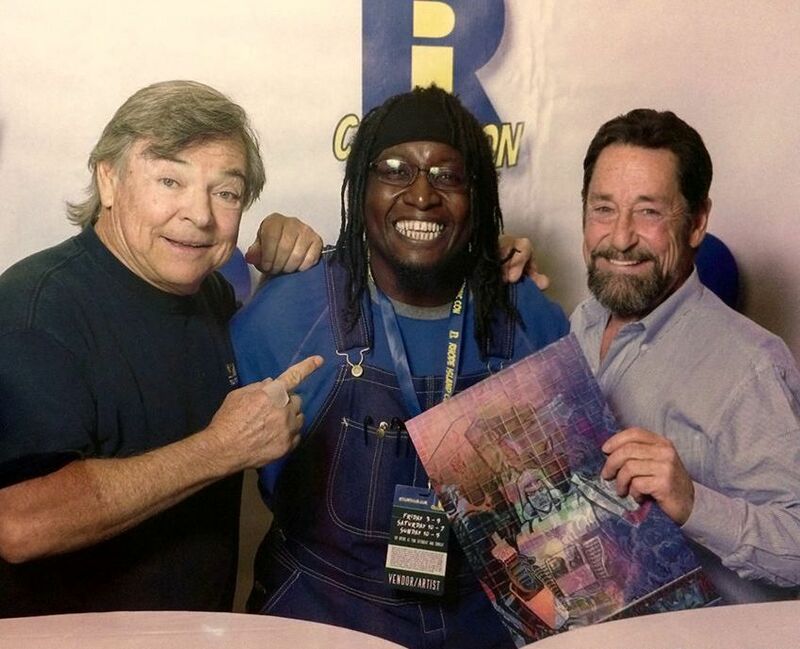 I would like to welcome illustrator/artist Frankie B. Washington back to The Qwillery. 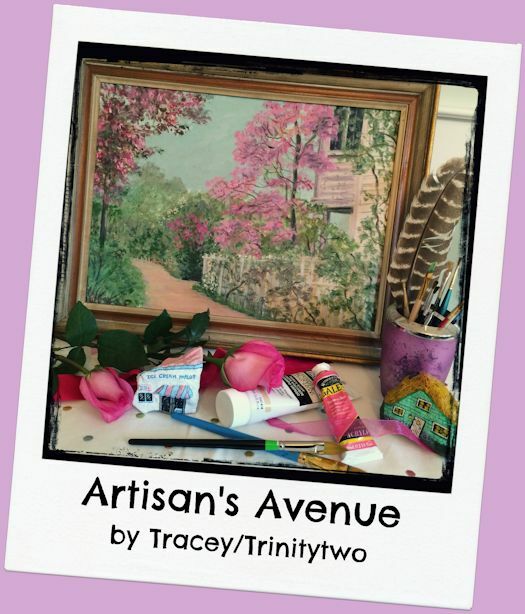 Tracey M: Frankie would you tell our audience a bit about your creative background? Frankie B. Washington: Once Upon A Time in the community of Jamaica Plain, Massachusetts a youngster (that would be me) was given the gifts of a pencil and the brown shopping bag that mama had brought the groceries home in... And set to the task of illustrating what came to his young mind. My creativity started at a very young age and was influenced by comic books, novels, television and films. I remember that out of all my friends, I tended to get very detailed with our fantasy games. For instance, I had to know how big a dragon was and the shape of its wings in order to add more credibility to its existence. This of course annoyed many of my friends but I felt justified that the dragon would reflect a character that could exist longer - if it was concepted better. This frame of thinking carried me thru middle, high and eventually art school. I believe to truly create a character or scenario you need to devote time to establishing a solid foundation to build your idea upon. It all began with a brown grocery bag and a small pencil. 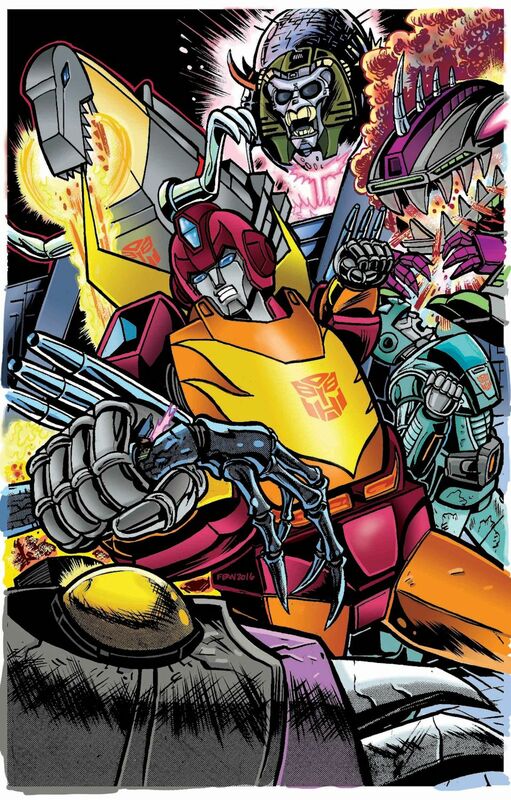 TM: You've worked for multiple companies as a commercial illustrator, how did you begin accepting commissions for artwork from individuals? And what has been your favorite commission to date? FBW: I've been a freelance illustrator for 26 years now, so the idea of accepting commissions started around 26 years ago. I mean the reality is that being self-employed is not an easy job to undertake. Those of us who have survived the shifting waters have learned how to operate our vessel more effectively and remembering that we need to constantly be on the hustle for clients. I will admit that this is the most exciting and addictive part of the career. I really love pitching what I can do and offer to a potential client. Then the wait to see if I've gotten the gig or not. I'm a stern believer of the "One Door Closes ... And Five More Will Open". I live it every single moment of the day. I'm addicted to that sensation. 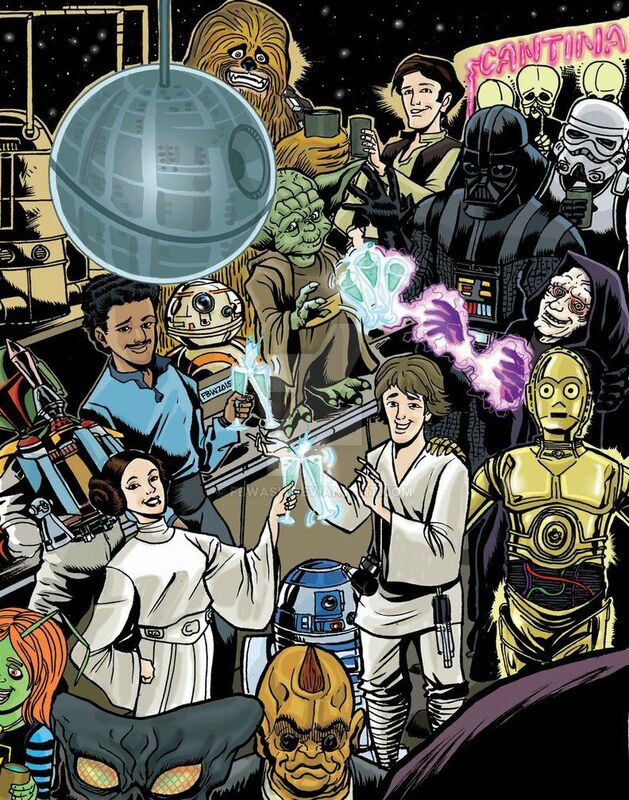 TM: You've worked in Film, Animation, RPG/Magazine Print, Comics, Editorial, Advertising, Toys, Video games, Trading/Sketch Cards. Do you have a favorite field and if so why? FBW: The truth is that I have a love for Advertising because it really shaped me up as an artist in dealing with the commercial aspect of the business. What I mean is that it helped me to see that art is what you make of it and that business has a part to play in the grand scheme. I learned how to produce art at a faster pace, yet not lose quality of the image. My ability to express my ideas and even pitch myself was all because of advertising. So I have a special place for it BUT my REAL passion has always been to work in the comic book industry. Just any way to be able to do sequential art and really challenge my storytelling skills. To develop characters that might be seared into the subconscious of a young person who happens to also have a pencil and brown paper bag in front of them. I'm so happy that I've taken chances and gotten the opportunity to dabble in so many aspects of the art industry. TM: What are some of the things that inspire your art? FBW: Everything inspires me in some form... or fashion. My girlfriend Jess, is constantly barraged by me creating stories from nothing with her in it. I also include our cat, Shadow and friends as well. This is something that I've always done and it's helped me to create some really cool things. I tend to also read various books and novels, I really can't peg one genre because I'm open to anything. This goes with music as well because each and every sound offers another wonderful inspiration for me. TM: Please tell us about something that you are currently working on. 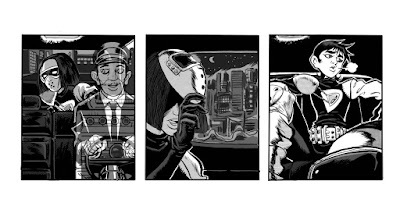 FBW: I'm currently working on the web comic series called Secret Lives Of Villains: https://cambriancomics.com/. 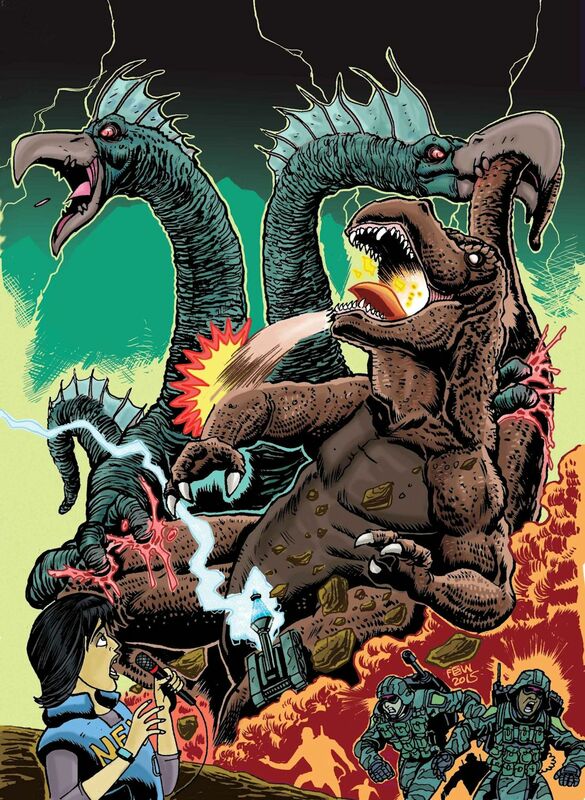 I'm also the artist for The Mighty Mascots which is debuting in the anthology called Reckless Chronicles by Reckless Sidekick Productions: http://www.heroenvy.com/reckless-chronicles.html. 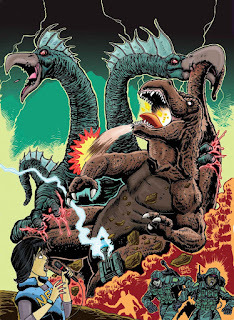 I also did a variant cover for Night Of The Fire Beast: https://www.facebook.com/Firebeastdorugan/photos/a.462295670602813.1073741828.430616807104033/574455442720168/?type=3&theater. TM: What are some of your favorite things you have done? FBW: One the greatest things that I'm so blessed to have done and I still go on about was my climbing of Mt. Katahdin in 2003. 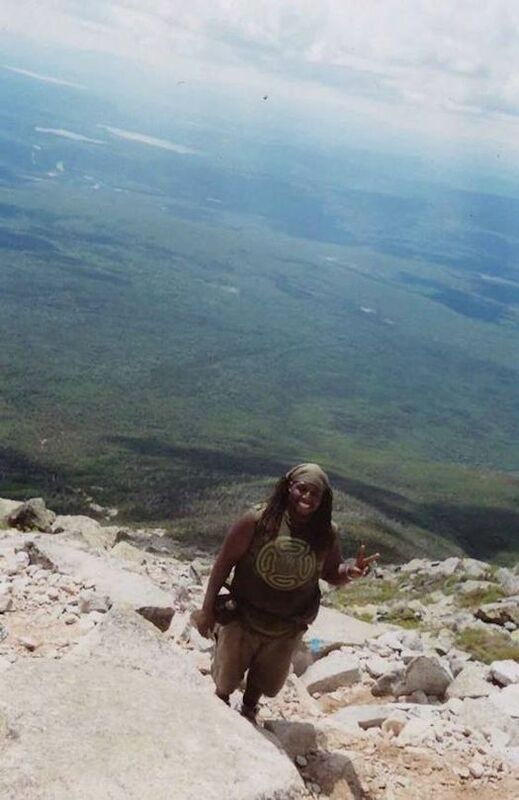 Reaching the summit was an amazing thing and an analogy of how I truly wanted to live. To at least attempt to climb something that seems impossible and succeeding when you've given your all. TM: Is there a cool story you'd like to share about a commission or any of your artwork? TM: What's new and exciting for 2016? TM: Ask and then answer a question about your work that I haven't asked. FBW: Frankie do you ever get asked whether you did all the artwork you posted... Or not? Since there's such a rash of artwork being stolen and used by people. FBW: Wow, Great question. When I look at the body of artwork that I've done. There are times that I can't believe I really did all those pieces. I can honestly say that YES - I drew everything from rough sketch to final art. Working as a commercial illustrator, I've had to adapt my style on numerous assignments to fit the needs of the client. I feel this has really helped me immensely because I can't really be placed in one genre of the art industry. I always admired the title of Illustrator because it meant to me that this individual could draw anything and for any client of need be. It was never a question of style but whether the illustrator can rise up to the task set before them and execute the assignment. Which of course makes the client very, very happy. Confidence men prowl the streets for fresh marks. Mediums swindle the newly bereaved. 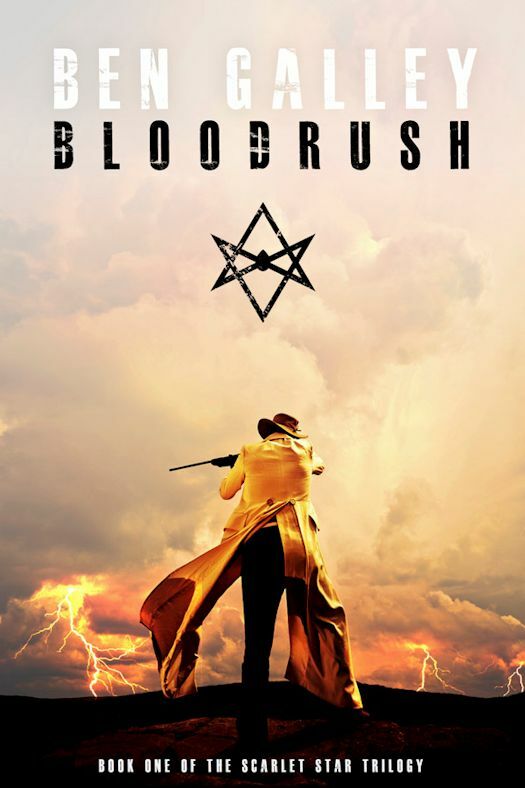 Into this world of illusion and intrigue comes William Mumler, a manipulating mastermind and criminal jeweler. Mumler hopes to make his fortune by photographing spirits for Boston’s elite. 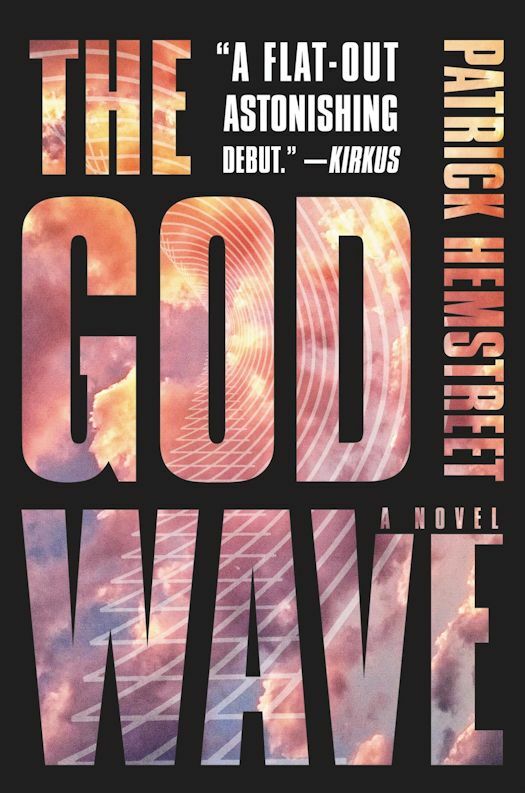 The key to his venture: a shy girl named Hannah who sees and manifests the dead and washes up on Boston’s harbor along with her strange, intense mother, Claudette. As Mumler and Hannah’s fame grows throughout Boston, everybody wants a piece: Bill Christian, a brothel tough; Algernon Child, a drunken rival; Fanny A. Conant, a sly suffragette; and William Guay, a religious fanatic. 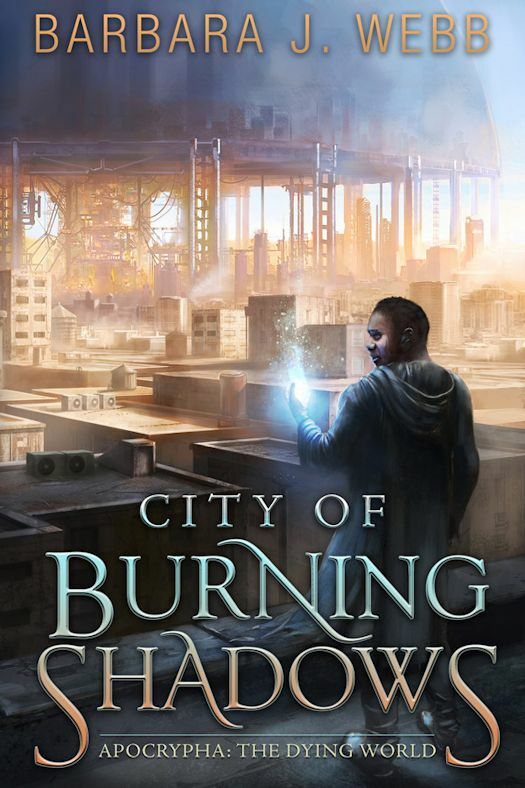 These rogues among a host of others, including the great spirit rapper Kate Fox, form powerful bonds with the spirit photographers, one of which will end in murder. Mumler’s first and last mistake: the dead cannot be made to heel. 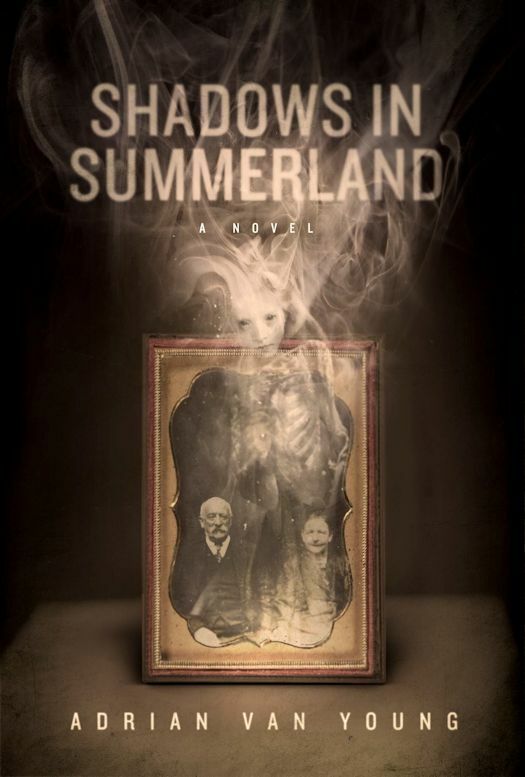 Roughly based on the real-life story of William H. Mumler, spirit photographer and his clairvoyant wife, Hannah Mumler, Shadows in Summerland immerses the reader in a shifting world of light and shade where nothing is quite what it seems at first glance. 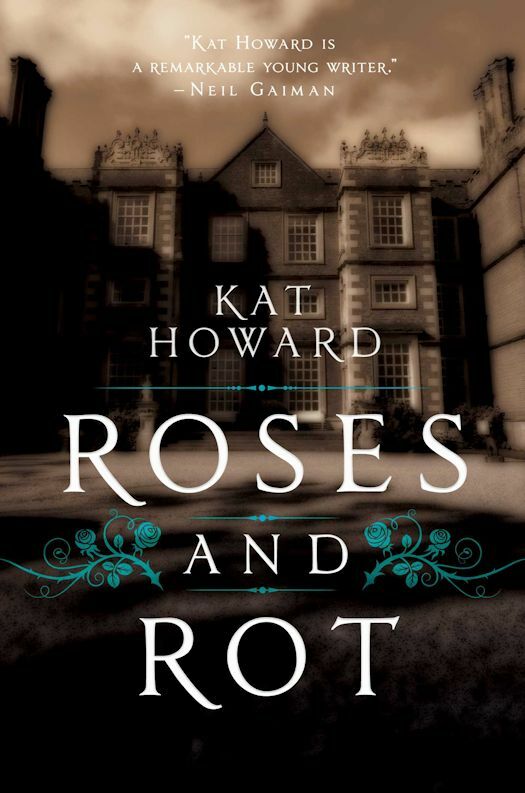 A soaring and resplendently Gothic novel spanning three decades, it is as much an homage to the Golden Age ghost stories of Edith Wharton and Henry James as it is a companion to the revisionist historical epics of Peter Carey and Sarah Waters, with a little steampunk all its own. I have to share the book trailer! I love it! 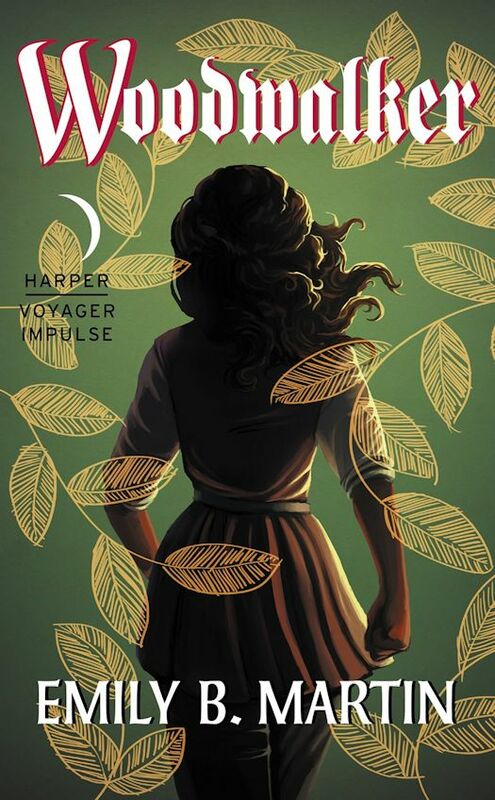 Note that the cover for Woodwalker was also created by the Author! Read about "The Evolution of a Cover" at Emily's blog here. 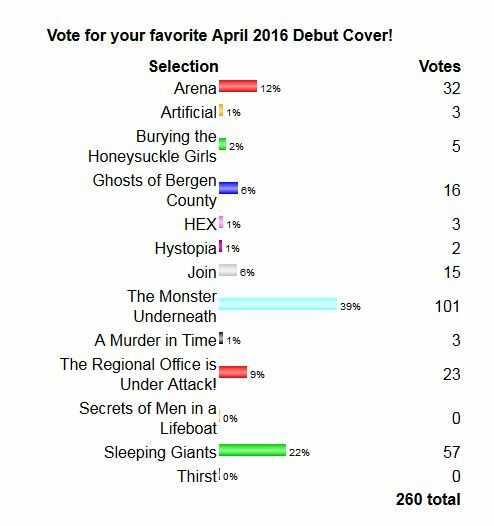 The winner of the April 2016 Debut Author Challenge Cover Wars is The Monster Underneath by Matthew Franks from Samhain Publications with 39% of all votes. Thomas: Thank you. I finished my first short story when I was ten. Before that, I had started about a thousand, but then a buddy would ring the doorbell and ask me out to play soccer or climb roofs or set fire to some boxes (or all three at the same time) and I would forget about the story. But that first finished story was a present to my grandmother’s birthday at Christmas. It was a kind of sci-fi Christmas Carol, featuring me and my sister in Bethlehem in the year 3.000, and we had to save our grandmother from the hospital as she was giving birth to the AntiChrist. It’s been a while, so I can't really judge it on its literary merits. Thomas: I'm one of those writers that like to plot a lot. But of course, as you’re writing, your subconscious takes over and comes up with all these little (and sometimes big!) surprises that are way, way better than you could ever have cooked up rationally. So you go with that. And that is a good thing. Thomas: Mostly, setting time aside to actually do it! The success of HEX has been overwhelming. 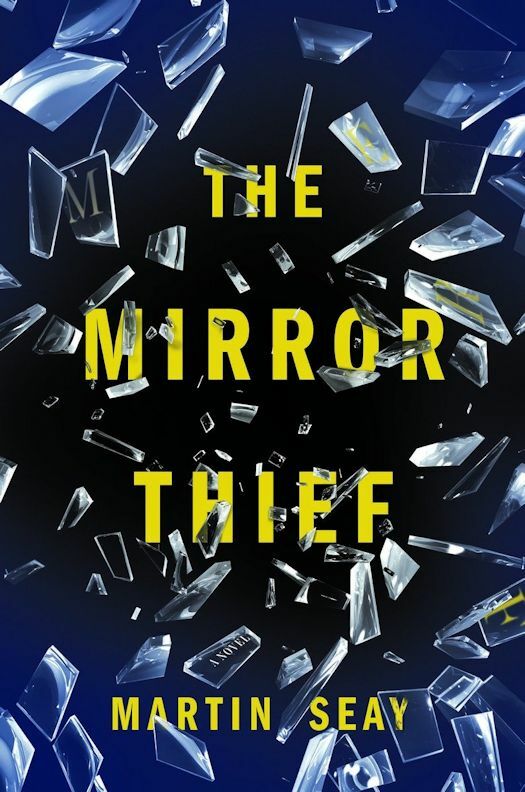 After it did very well in Holland and Belgium, it has now sold to countries all over the world, and Warner Bros. is developing a pilot for a TV series. It’s all fantastically wonderful, but it took a lot of my time. 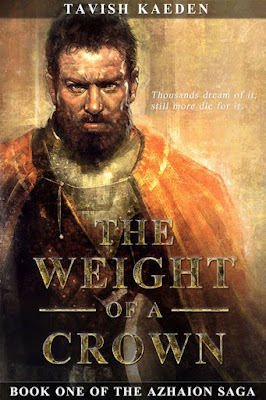 I worked closely together with the translator on the English version of the book, and then there are events and promo and all sorts of other stuff that comes my way. What works for me is if I lock myself in some place abroad, to be socially secluded for a period of time in order to focus on writing the new book. I have family in northern Thailand and in the Swiss Alps, and they’re kind enough to let me use their houses every now and then, as long as all the nasty little things I cook up happen in the books, not in their house. Thomas: Reading as many good books as I can. And then write the best book that I would want to read myself. TQ: Describe HEX in 140 characters or less. Thomas: This book will haunt you in your sleep. Guaranteed. Mwuhaha. TQ: Tell us something about HEX that is not found in the book description. TQ: What inspired you to write HEX? What appeals to you about writing Horror? Thomas: I wanted to write a story about a witch ever since I was traumatized by Roald Dahl's book The Witches, and the 1990 movie adaptation of it. The moment when Anjelica Huston, the Grand High Witch, takes off her mask... gosh, I was seven years old, and I didn’t trust any women for the next six months. Imagine what my winter was like, with women wearing gloves all the time. I saw witches everywhere. Then I watched The Blair Witch Project when I was fifteen, and of course, the scary part there was that you did not see the witch. Katherine van Wyler, the witch in HEX, has influences of both. Of course she has this horrible, disfigured face because her mouth and eyes are sewn shut... but for exactly the same reason, you never really get to see her. If you can’t see someone's eyes, you'll never know what they are thinking. That makes her so scary. As for horror in general: it’s just a quirk. As a kid I used to collect model airplanes. You know, the ones you have to glue together from scratch, then paint all the way. It took me days. When it was done, I took a sledgehammer and crushed the plane right through the middle. I burned the edges with matches and used burnt cloth and wrinkled aluminium foil to simulate wreckage. Then I placed my toy ambulances around the crash scene and showed it to my mom. I was, like: Tadaaaa! She wasn’t amused. I guess it proves that I’ve always been drawn to the dark side of things. But at least I never poked the eyes out of my teddy bears. TQ: What sort of research did you do for HEX? Thomas: Mostly stuff about the witch craze in the seventeenth century, about superstitions and about omens. Did you know there is actually an Oxford Dictionary of Superstitions? So cool. Also, I did a lot of research about the Hudson Valley area where the book is set, which has a lot of Dutch history. I am from the Netherlands, and although I’ve visited the area many times and I used to live in Ottawa (I was a uOttawa student! ), you still want to make sure you get everything right. But both the translator and the editor lived in the Hudson Valley for years, so they were both of great help. TQ: Why have you chosen to include social issues in HEX? TQ: Which question about HEX do you wish someone would ask? Ask it and answer it! Thomas: I guess it would be the obvious one, once you've read it: So who was it, at the front door? And of course, I'm not gonna tell! Or maybe: Do you really believe people are so messed-up they would react this way? And I'd say: yes, I'm afraid so. As soon as you'll pull the carpet of normality from underneath us, we start to crumble. TQ: Give us one of your favorite non-spoilery quotes from HEX. Thomas: I love this bit, as it tells so much about these people: "Theo Stackhouse, who had been a garage owner and car mechanic the week before, eagerly accepted the office of town executioner and was summoned to the stables of the councilman's estate on Wednesday night. He practiced first on a leather saddle, to master the art of flogging, and then on a floundering, bound calf, to prepare himself for the reflex of living flesh. That night before he went to bed he took two Advils for the intense aches in his upper arm, but despite the pain, he slept like a baby." 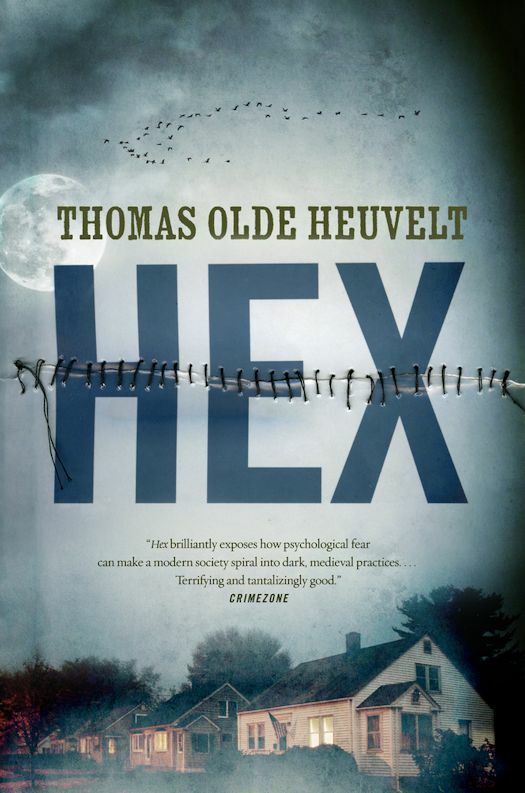 Thomas: I tremendously look forward to the reception of HEX in all the different countries where it will appear. This has always been a dream of mine and I've been working for years to realize it. Now people in China and Turkey and Canada and France and Serbia and many other countries are suddenly reading my work. In Holland, I've been getting so many messages from readers who told me they had to leave the lights on at night after finishing the book, in order to fall asleep. I wonder if it will have the same effect on people abroad. Also I'm going on tour in some of these countries, starting with a US tour in June and July. That's going to be special. 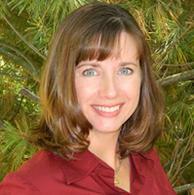 Please welcome Susan Furlong to The Qwillery. 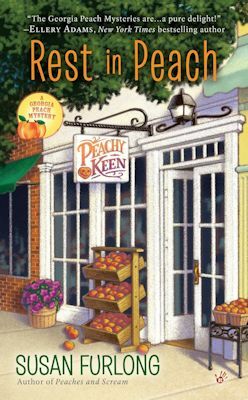 Rest in Peach, the 2nd Georgia Peach Mystery, was published on April 5th by Berkley. Rest in Peach is the second installment in Susan Furlong’s Georgia Peach Mystery series. The story is set in Cays Mill, Georgia and follows Nola Mae Harper, a former world aid worker who has recently returned to her hometown to reconnect with her family and help run their magnificent Peach Farm. Nola is in the process of opening a delightful little store front that will feature gifts made and inspired by her family’s delicious peaches. Unfortunately, her work is interrupted when a local woman is murdered in her best friend’s dress shop, and another close friend is the prime suspect in the crime. 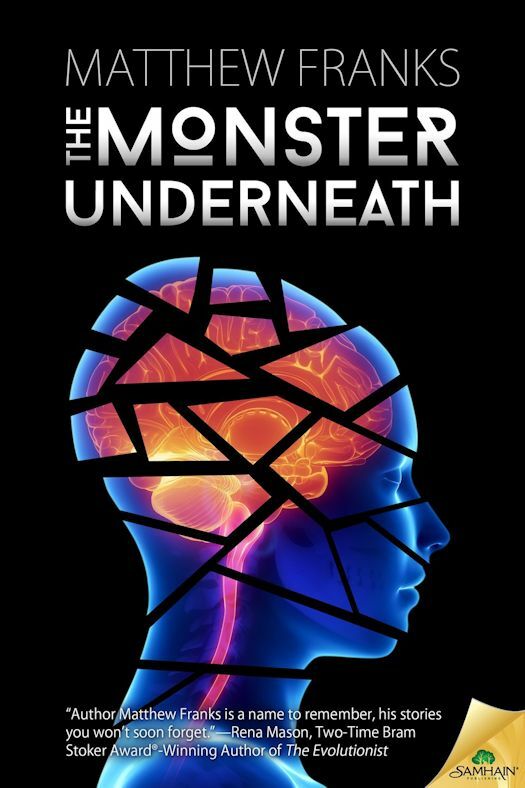 Nola uses her curiosity and past experience in sleuthing, to help her friend beat a murder charge and stop a killer from striking again. Nola Mae is still trying to find her feet now that she has faced her demons and returned to the home she once loved. She is aided in this task by devoted family and friends. Her parents are lovely, down to earth characters that any kid would be proud to claim as their own. Nola’s brother and sister, one a lawyer and the other a stay-at-home mom and rising socialite in the small town, are always there whenever Nola has need. Hattie McKenna, Nola’s oldest friend, runs the aforementioned dress shop and is sweet and supportive. 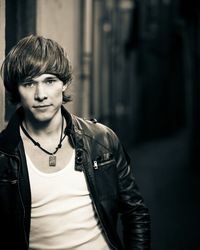 Hattie’s brother, hunky carpenter Cade McKenna, is someone that confuses Nola. She has feelings for him but is incredibly insecure about them, especially given Cade’s cool demeanor recently. Ginny Wiggins, a vivacious red head with a quick but short lived temper, runs a local diner with her husband Sam. 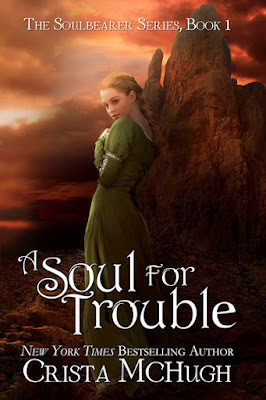 Ginny’s temper has gotten her into the thick of things when the subject of her public anger is found murdered soon after a heated confrontation over a cotillion gown. The plot of the novel revolved around the biggest event in the small town, the annual Peach Cotillion, where the local debutantes will make their triumphant entrance into society in a series of events that culminates in an old school cotillion, complete with elaborate white ball gowns for the young ladies. To fuel the plot readers are introduced to the local debs and their moms, one of which will be the victim of a brutal murder. Maggie Jones is the local preacher’s wife, a mousy and timid creature who dotes on her children, young deb Belle and her twin brother Nash. Debra Bearden, a catty local mom, is proud to show off her beautiful daughter Sophie. 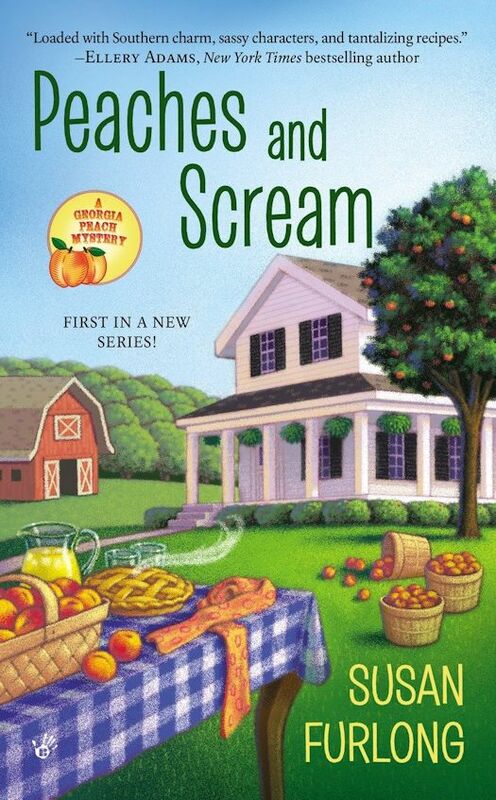 And Vivien Crenshaw, the murder victim, is just as proud of her daughter, the reigning Peach Queen, Tara, but in a much more offensive way. Vivien is arrogant and rude and makes no friends in the town with her demanding ways and conceit. Each of the women have their own reasons for disliking Vivien, but Ginny, whose sweet daughter Emily has a dispute with Tara and Vivien over a ball gown, is the only resident who had a recent public feud with the victim. 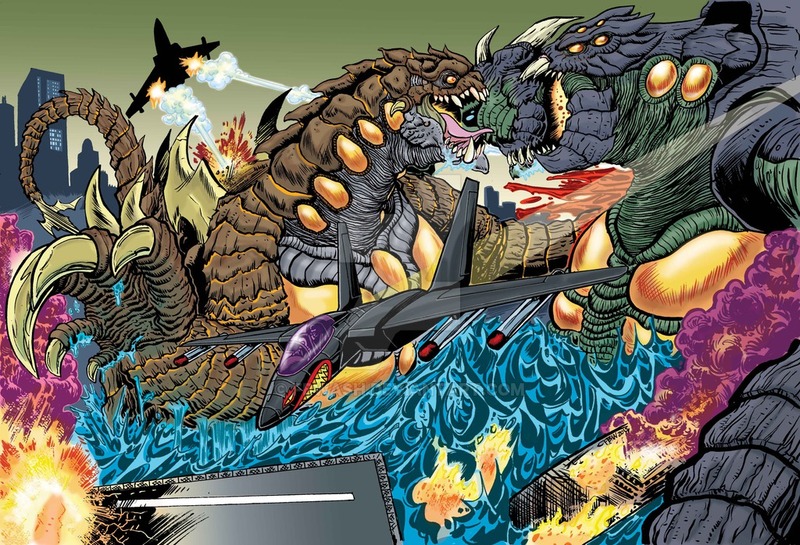 We also get to know more local residents in this installment, with many having appeared in the first book in the series, but also with a few new faces. Francis Simms is the local, beady-eyed reporter who makes herself a nuisance with her pointed accusations and questionable print conclusions. Sherriff Maudy Payne is again in charge of the murder investigation, and resents Nola’s involvement, having tangled with her in the previous book. Maudy has a chip on her shoulder and is not in any way interested in investigating the crime if it takes her in a direction she doesn’t like. Dane Hawkins, aka Hawk, Nola’s old flame is back in town with his dangerous good looks. Dane is a private investigator now temporarily employed as supplemental security by a local congressman and his wife. Congressman Wheeler is a typical southern politician in an election year, and is hoping to boost his voter base by offering his stately old home as the setting for the Peach Cotillion events. The congressman’s wife, Stephanie, is also portrayed as a typical political spouse, being well polished and poised in any situation. Lastly, we meet young and troubled teen, Carla Fini, who has been shipped to Cays Mills to live with relatives after one incident too many in her big city home. Carla plays a surprise role in the denouement of the mystery, but is a strong character before this and one I think could be worth expanding on in subsequent novels in the series. Rest in Peach is a very good second look into this series. The main characters and townspeople find even more depth and become more like friends in this book. The interpersonal relationships are becoming even more defined and interesting and the town itself starts to play an even stronger role, which I find to be a plus with a cozy mystery series. 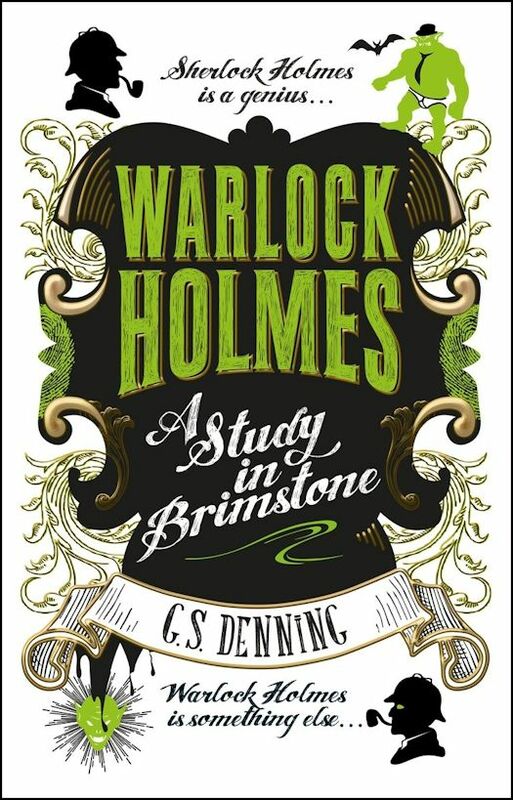 There is an exciting end to the mystery and the personal subplots that run throughout the story are also nicely concluded. The author includes some peach themed recipes at the end, and there is a snippet from the next book in the series, War and Peach, which I will definitely be looking forward to reading when it is published. Who and When: The contest is open to all humans on the planet earth with a US mailing address. Contest ends at 11:59 PM US Eastern Time on May 10, 2016. Void where prohibited by law. No purchase necessary. You must be 18 years old or older to enter. This year The Qwillery is one of 10 blogs participating in the 2nd year of the Self-Published Fantasy Blog-Off (SPFBO2). 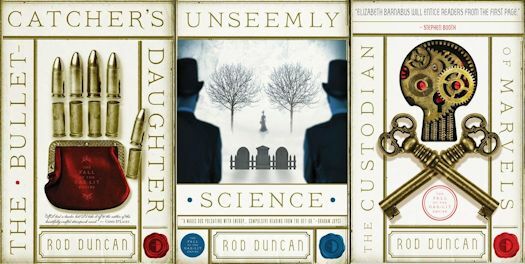 We'll be reading a lot of books to find the one novel that The Qwillery will put forward to be considered by the other SPFBO2 blogs. You can read more about SPFBO2 here. 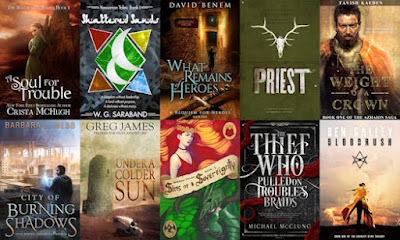 The 10 novels that last year's blogs chose as their blog's top book are included in the SPFBO Bundle from StoryBundle and I get to give a away a Bundle to one lucky entrant. 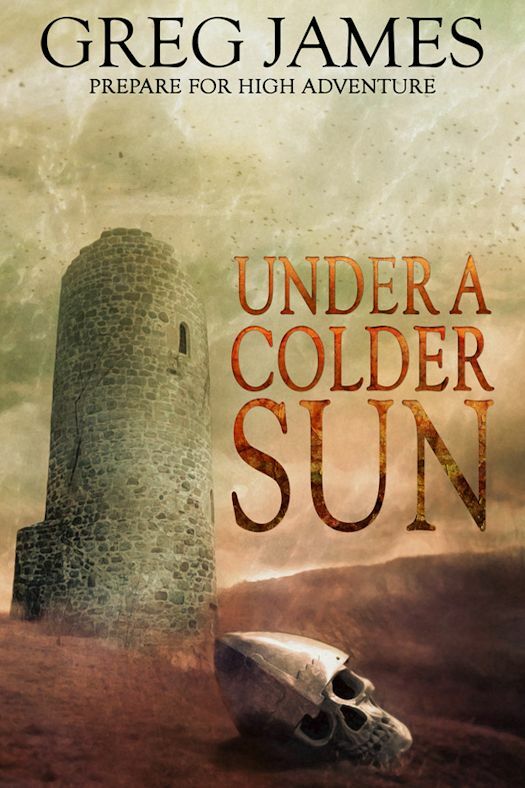 This is a unique bundle, its books chosen not by me, but by reviewers who took part in the first Self-Published Fantasy Blog-Off organized by Mark Lawrence. Each reviewer received over twenty-five books and a mission: Choose one. This bundle contains the books those reviewers put at the very top of their list. 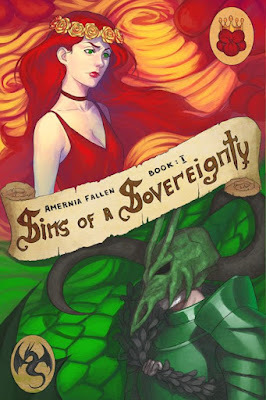 The SPFBO Bundle includes some of the coolest indie fantasy around. Crista McHugh's A Soul for Trouble gives you a witch named Trouble, possessed by the god of chaos. 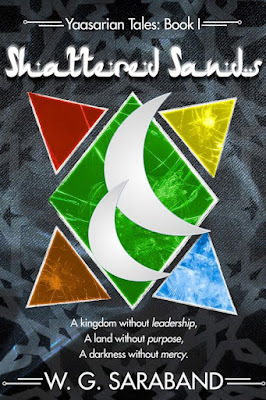 William Saraband's Shattered Sands follows a slave girl suddenly empowered by forces older than the desert itself. 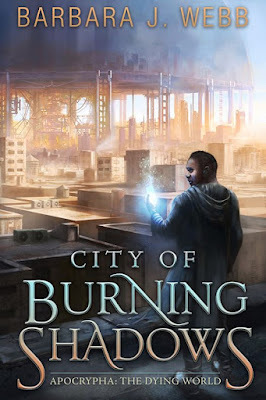 You'll delve into the more-than-murder mystery of Matthew Colville's Priest, and follow another priest trying to save the world after the gods disappear in Barbara Webb's City of Burning Shadows. And The Weight of A Crown from Tavish Kaeden serves up the deep epic of a recently-united realm on the verge of fracturing. 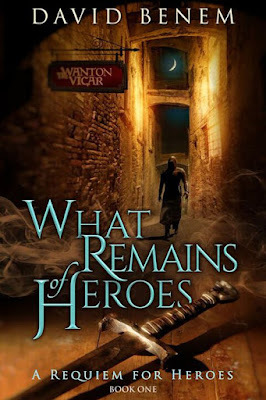 There is the sharp warrior who knows the value of leaving heroism behind in Under A Colder Sun by Greg James, and the ruined hero who chances into a way to surmount the past in David Benem's What Remains of Heroes. Plague Jack delves deep into a brutal world of conspiracies, consequences, and backlash against a conqueror in Sins of the Sovereignty. 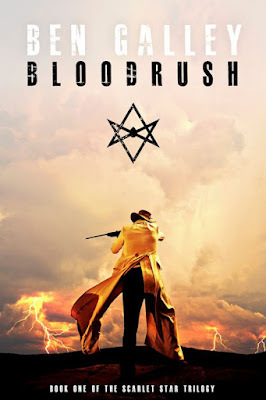 Ben Galley smacks a young man into a frontier Wyoming filled with blood magick and secrets in Blood Rush. 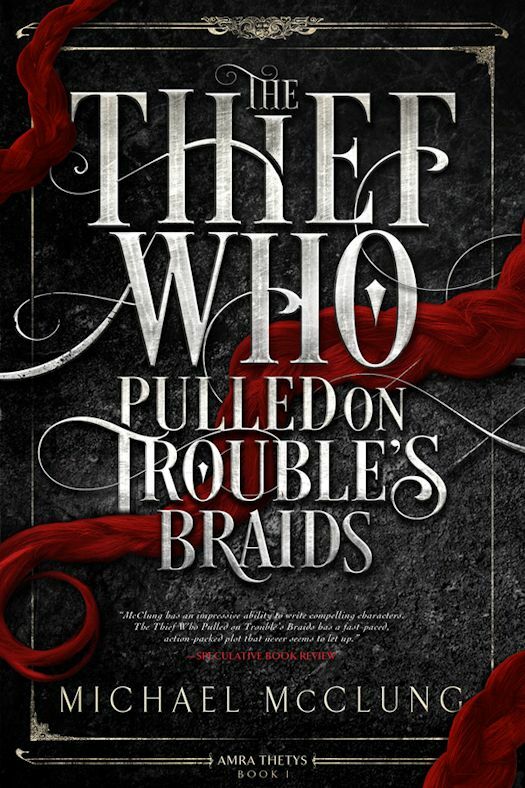 And Michael McClung's The Thief Who Pulled On Trouble's Braids—the novel scoring highest in the Self-Published Fantasy Blog-Off—races along with a sassy, smart thief who must find an artifact everyone thinks she already has before she's killed for it. StoryBundle lets you choose your own price, so you decide how much you'd like to support the writers. For $5—or more, if you'd like—you'll receive the basic bundle of five novels in DRM-free ebook format. For the bonus price of at least $15, you'll receive all ten novels. If you choose, a portion of your payment will go toward supporting different charities such as Mighty Writers and Girls Write Now. 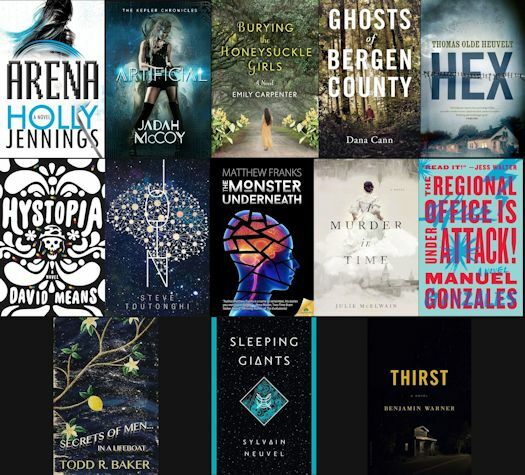 Over the years, StoryBundle and its participating writers have donated thousands to support awesome charities doing great work. Blair writes fantasy—adventurous, epic, and dark. 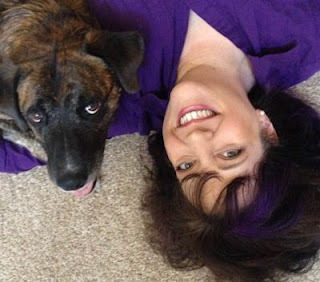 She is a graduate of Viable Paradise, chairs SFWA's Self-Publishing Committee, and runs a Patreon for self-defense and fight scene writing. When not writing, she hangs out with family, camps alone, trains in Okinawan karate, and speaks to groups on resilience and wellness. She loves traveling to places both wild and domesticated. 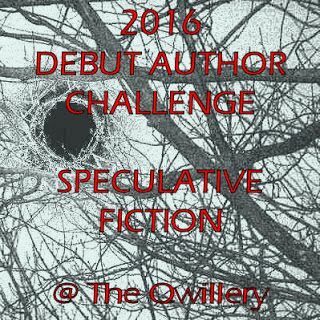 What: One entrant will win The Self-Published Fantasy Blog-Off Bundle from the StoryBundle. Winner will be provided with a code to redeem to download the Bundle. Who and When: The contest is open to all humans on the planet earth with an emailing address. Contest ends at 11:59 PM US Eastern Time on May 1, 2016. Void where prohibited by law. No purchase necessary. You must be 18 years old or older to enter. Please welcome Rod Duncan to The Qwillery. 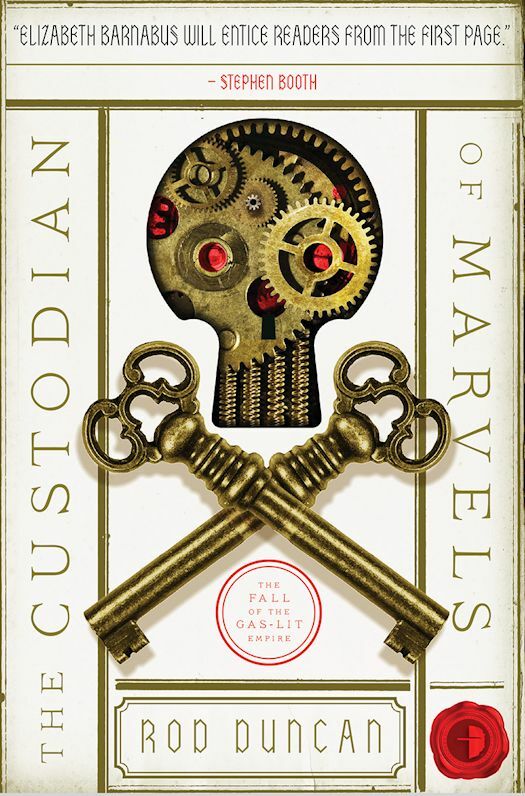 Rod's most recent novel is The Custodian Marvels, the 3rd book in The Fall of the Gas-Lit Empire series, from Angry Robot Books. TQ: Welcome back to The Qwillery. What is the most challenging thing for you about writing? Are you a plotter, a pantser or a hybrid? Rod: The most challenging thing is keeping the outline of a whole series of novels in my head. Yes, I create plans of each novel. Lots of them. And each of them turns out different. When it comes down to it, a plan of a novel is only good for helping me to write the next chapter. Once the chapter is written, I have usually made discoveries that will change my ideas about where the book going. TQ: Describe The Custodian of Marvels in 140 characters or less. Rod: A heist & a date with destiny. It’s where the small adventures of Elizabeth Barnabus meet the big story of the fall of the Gas-Lit Empire. TQ: Tell us something about The Custodian of Marvels that is not found in the book description. It is a story of circus folk and high politics. 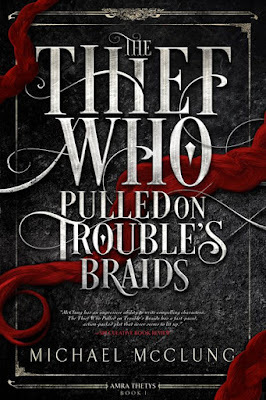 It is also a story of horrifying secrets and terrifying locks. One secret is hidden in the Bullet Catcher’s Handbook. Another is hidden in a vault below the International Patent Court. One lock is the hammer that fires a gun, another is the mechanism that holds a mighty door closed. I could tell you more, but it’s a secret. TQ: The Custodian of Marvels is the third novel of The Fall of the Gas-Lit Empire. What are your feelings on concluding the series? Rod: It is the end. But it’s not the end. Like so many things in the life of Elizabeth Barnabus, this is a paradox. 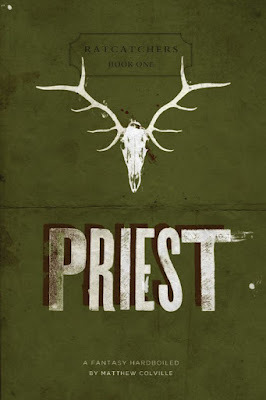 I can tell you that I have started to write the next book in this alternate history. But I don’t want to say more than that, because it might spoil things for readers of the series. When you get to the end of the Custodian of Marvels, I hope these vague comments will make more sense to you! TQ: The Fall of the Gas-Lit Empire series is Alternate History with a late Victorian setting. 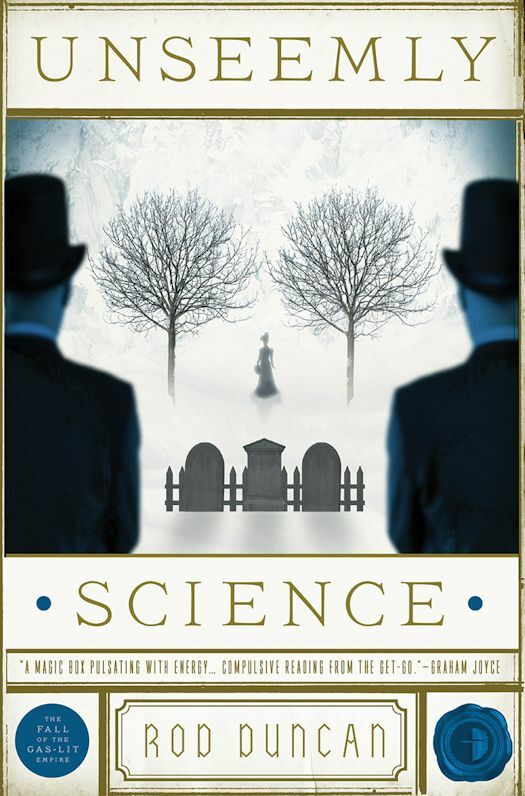 What appeals to you about writing Alternate History and AH set in the Victorian era? Rod: Alternate history has always appealed to me because it gives us the chance to ask “what if”? What if the Luddites had overthrown the government? What if technology had developed in a different way? I own a small mechanical calculator. It is a marvellous piece of engineering and design, containing many hundreds of moving parts. It would have cost a huge amount of money when new. But this one was thrown away because it had been superseded by the newly invented four-function electronic calculator. I doubt that anyone could make such a mechanical calculator today. It was the pinnacle of the technology. But what might have been developed in the world of mechanical calculation if the electronic calculator had not been invented quite so soon? Alternate history explores questions like that. As for the Victorianesque setting – I’m not sure why I like it so much. I certainly wouldn’t like to be living in that era. But there is something about the aesthetic that appeals. TQ: In The Fall of the Gas-Lit Empire series who was the easiest character to write and why? The hardest and why? Rod: I’m not sure which was the easiest character to write. But I will say that I particularly enjoyed writing Fabulo. 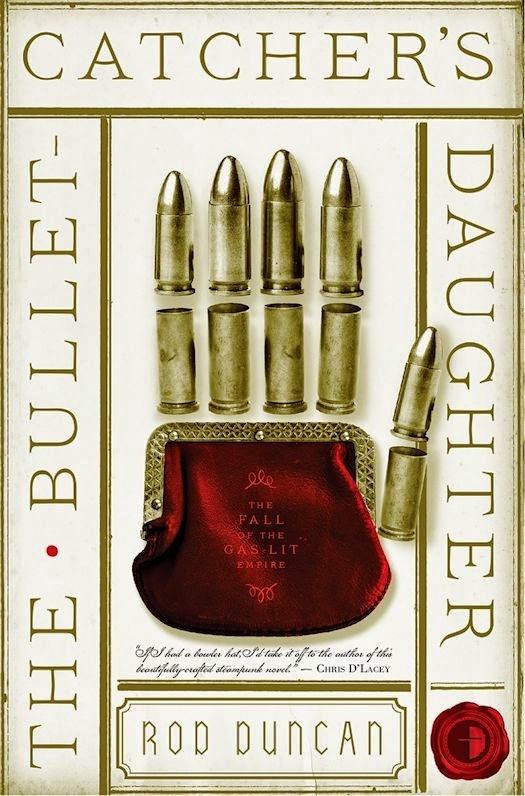 I had a very clear understanding of who he was when I wrote the Bullet Catcher’s Daughter. But in that story he was always overshadowed by Harry Timpson. In the Custodian of Marvels he has a bigger part to play. Readers will get to understand him far better. It is a great pleasure to be able to share him in this way. As for the hardest character to write – that was Elizabeth Barnabus. Of course, I know her best of all. I had no difficulty in knowing what she would feel or think or how she would behave. But for a couple of chapters in this story she is “not herself”. That is to say, she goes to a very dark place. My problem was working out how to convey that journey through her own voice. TQ: Why have you chosen to include social issues in The Fall of the Gas-Lit Empire series? Rod: Drama comes from conflict. Conflict often comes from inequality. And inequality lies at the heart of most social issues. Or, to put it another way, comfortable people aren’t so interesting to write about. Most of the characters in these books are marginalised in one way or another. Fabulo is a dwarf. Tinker is a runaway from an abusive father. Elizabeth was born in a travelling show. It is because of these differences, and others that I can’t reveal here, that they go on to do extraordinary things. TQ: Which question about The Custodian of Marvels or The Fall of the Gas-Lit Empire series do you wish someone would ask? Ask it and answer it! Rod: I think you’re asking me to do your job for you! 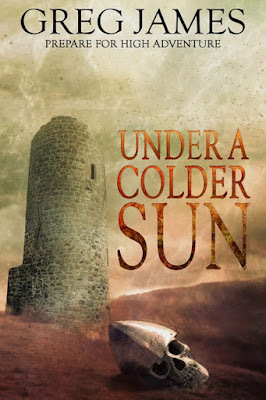 Rod: As I said, I’m writing the next book set in this alternate history. I don’t want to reveal too much of that, because it might count as a spoiler. But I will tell you that in the last month, I have been researching the Louisiana Purchase, the sound of wooden beams moving against each other and various effects of the Labrador Current. Make of that what you will. Rod: Thank you. I always enjoy Qwillery questions. 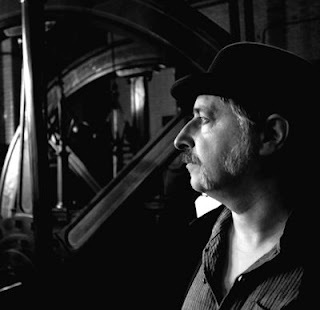 You can find Rod online at www.rodduncan.co.uk and follow him @RodDuncan on Twitter.